On Monday the Raspberry Pi Foundation announced a new hardware initiative. 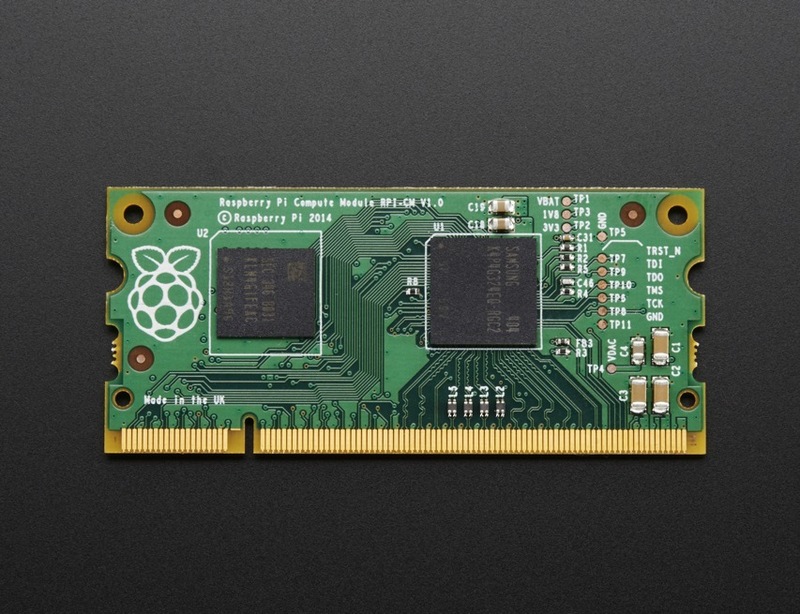 The Raspberry Pi Compute Module contains the guts of a Raspberry Pi in a brand new format. In essence it offers just the brains, including the Broadcom BCM2835 system-on-a-chip (SoC), along with 512MB of RAM and 4GB eMMC flash storage. The design is implemented on a DDR2 SO-DIMM laptop memory model format. This means it's only 68mm x 30mm in size. In addition it connects to the host circuit board through an industry standard SODIMM connector (although the pin assignments on the board are completely different from a memory DIMM). As with the original Pi, these chips are all soldered to the host board, so they can't be upgraded (check out Adafruit's Compute Module blog post for more images). The whole point of the Pi Compute Module is to entice hardware hobbyists and device builders to create their own printed circuit boards (PCBs). The small footprint and standardised connector immediately opens up a host of opportunities for low cost DIY projects. As Eben Upton admitted, "Currently, you need a significant amount of space to accommodate the PI inside a product, and a wiring loom to connection the various ports on the board." Upton went on to say this had now changed because, "The Compute Module lets you accomplish this in a smaller space, with all signals routed on the carrier PCB." So what does this mean for hardware hackers? Well, they have much more freedom. The host circuit board can be specifically designed for each individual project. Need six USB ports, or none at all? No problem. After four camera ports? Go right ahead. Want to interface to a proprietary IO connector or host wi-fi, bluetooth and NFC wireless chips? It's all possible. Robotic driving and flying vehicles can be sleeker. Portable computing devices can be lighter. And operational power requirements are largely in the hands of the designer. Who knows what might emerge. Could we see a range of Pi-powered laptops? Maybe even a Pi smartphone? The possibilities are endless.